WRITE A NOVEL IN NOVEMBER! National Novel Writing Month (NaNoWriMo) is a nonprofit event that encourages kids and adults to tackle the challenge of writing a novel in November. Youth can sign up through the Young Writer’s Project at NaNoWriMo, set their word count and begin writing on November 1st. 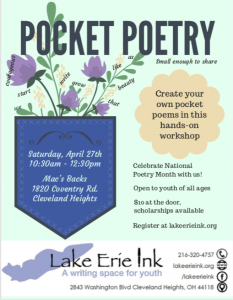 This year Lake Erie Ink has teamed up with Lit Cleveland to provide a series of workshops for adults and teens in 6th through 12th grade. Youth may attend all workshops for FREE except for the workshops on Nov. 10th and 17th. For those two workshops, please register at LitCleveland.org. Here’s the schedule. Tues. Nov 1st, 7-9 pm: Kickstart NaNoWriMo with a Novelist Panel and Come Write In! @ Lake Erie Ink. FREE FOR YOUTH. The evening will begin with a panel featuring Eric Anderson, Nivi Engineer, Chris Garson and Tess Kelly who will inspire you with their advice on writing fiction and meeting your NaNoWriMo goal. After the panel, stay for a “Come Write In!” evening until 9 pm. Youth will also receive help setting up their NaNoWriMo profile and word count goals. Thurs. Nov. 10th, 7-9 pm: Troubleshooting Fiction with Laura Walter, author of Living Arrangements @ Appletree Books. 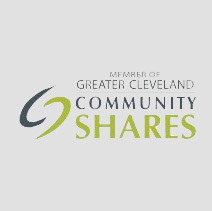 Register through Lit Cleveland. Use this workshop to troubleshoot your novel’s challenges. From navigating the plot to developing characters to just eking out your daily word count, this is the place to share your frustrations, questions, and successes. The evening will also feature a timed writing challenge to encourage you to tackle a daily word count goal. Thurs. Nov. 17th, 7-9 pm: Building Worlds and the Characters Living in Them with Linda Robertson, author of the Persephone Alcmedi series @ Lake Erie Ink. Register through Lit Cleveland. Linda Robertson will discuss the fundamentals of fictional world building and offer prompts to help you not only build a world but fill it with meaningful and memorable characters. Tues. Nov. 29th, 7-9 pm: Come Write In! Tea, coffee, hot chocolate, encouragement and advice provided by Lake Erie Ink @ Lake Erie Ink. Free. Wed. Dec. 7th, 7-9 pm: “Thank God It’s Over” NaNoWriMo Celebration in Ensemble’s “Playground” Theatre. Enter through Lake Erie Ink door. Bring fingerfood and potluck snacks. Share a few pages of your novel during the open mic. Free. Eric Anderson is the author of a novella, Isn’t That Just Like You?, and a book of poems, The Parable of the Room Spinning. His work has appeared in The Sun, The North American Review and others. Nivi Engineer is a novelist and playwright from Cleveland Heights. She’s the author of the Indian Girl’s Definitive Guide to Staying Single, The Story of a Story, The Saviors of Scarborough and other stories. She’s participated in NaNoWriMo the last five years and “won” once. Chris Garson, author of Perk Noir: A Mason Barnes Mystery, resides in Cleveland Heights with China and Rider, his two cats named from a Grateful Dead set list. After a long career in Information Technology at Progressive Insurance, Chris has turned to entertaining readers with stories. Tess Kelly is a passionate teen writer who has been participating in NaNoWriMo since 2011. She successfully completed the challenge every year since 2013, and is looking forward to participating again this year. Her fiction and poetry have been published in TeenInk magazine. Linda Robertson is an internationally published author. She has written six urban fantasy novels in the Persephone Alcmedi series (set in and around Cleveland, Ohio) which are available from Simon & Schuster’s imprint Pocket Books, and a handful of fantasy short stories in various publications. She won the 2006 Florence B. Allen writing competition, hosts workshops about the craft of writing, and plays electric guitar. Laura Maylene Walter is the author of the short story collection Living Arrangements (BkMk Press), which won the G.S. Sharat Chandra Prize and a national gold IPPY. Her writing has appeared or is forthcoming in the Kenyon Review, The Sun, Poets & Writers, Michigan Quarterly Review, Tampa Review, Portland Review, and elsewhere. She was a 2013 Tin House Writers’ Workshop fiction scholar, the recipient of the 2011 Ohioana Walter Rumsey Marvin Grant, and the former fiction editor of Mid-American Review. She is a contributing editor for Cherry Tree and Neutrons/Protons and blogs for theKenyon Review.